Christopher Hardy, an American based in Tokyo since 1989, is a highly acclaimed percussionist, composer and educator. 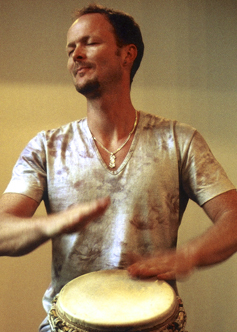 Chris has a background in Western percussion from the University of Michigan and is a hand drum specialist whose primary focus is on Middle Eastern, North African, West African, Brazilian and Latin percussion. He also performs and records in Renaissance, jazz, pop, rock, world music and other creative musical settings and has synthesized this variety of influences to create a unique and individual voice. His solo CD “Touch” released under the Victor label, was voted “Best Popular Album of 2002” in Japan. In addition to leading his own group “TGA”, Tokyo-based world music group, Chris has performed with such diverse artists as Sting, Kazuya Yoshii, AI, UA, Hamza El Din, Kazumi Watanabe, Yosuke Yamashita, Ikuko Kawai, Kunihiko Ryo, Origa, John Neptune, Hidetaro Honjo (shamisen), Eitetsu Hayashi (taiko), Hideo Kanze (Noh performer), Kim Duk-Soo (Samul Nori), Onoe Shoroku (Kabuki), Shuntaro Tanikawa (poet), Kazutoki Umezu, Sizzle Ohtaka, Kato Kazuhiko, Konosuke Sakazaki, Akina Nakamori, Minako Honda, Dereb Desalegn, Akiko Grace, Ted Piltzecker, El Zafete and composers Lou Harrison, Elliot Carter, Kaoru Wada, Ohiro Minato and George Crumb. Chris has studied percussion with Michael Udow, jazz vibraphone with Ted Piltzecker and Arabic music with Hamza El Din. In addition to being on the faculty at the Senzoku College of Music in Tokyo, he also presents lectures, master classes workshops and school concerts. Most recently, he performed with the resident Cirque du Soleil show “Zed” and served as musical ensemble director for the Tokyo performances of the “O Vertigo” dance troupe (Canada). Chris can be heard on the Victor, JVC, Columbia Denon, Polydor, EMI, Equilibrium and Sony labels. Theme: profile | © 2019 Christopher Hardy Music. All Rights Reserved.